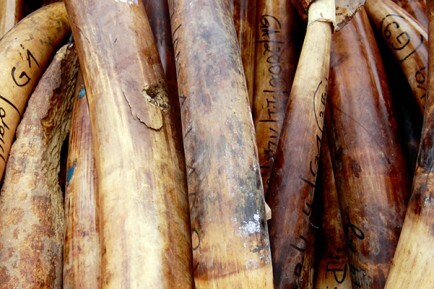 Is Ivory Coast becoming an illegal wildlife trade hub? Ivorian authorities must safeguard the country against the growing threat of wildlife trafficking. Since 2016, Côte d’Ivoire has recorded at least five major events (seizures and/or arrests) related to wildlife trafficking. The most recent of these occurred in January, with the seizure of a staggering 578 kg of ivory, and over half a ton of pangolin scales, leopard skins and other items. According to media reports, the pangolin scales were likely poached and harvested in Côte d’Ivoire, while the elephant tusks originated from countries in West, East and Central Africa. These seizures and arrests are the result of multiple investigations aimed at dismantling networks of wildlife traffickers. These investigations are being carried out by the Ivorian authorities, notably the Transnational Organised Crime Unit (UCT) and the Ministry of Water and Forests. They are assisted by the EAGLE Network – a non-governmental organisation that works to fight wildlife trafficking. The seizures indicate that wildlife trafficking is a major phenomenon in the country, and while they highlight regional and international ramifications, they don’t indicate the magnitude of the crime. However, based on these reports and what is known about wildlife trafficking, this crime still seems smaller in scale in Côte d’Ivoire than other countries of the region (such as Nigeria or Guinea) or elsewhere on the continent, such as East and Southern Africa. That being said, the recent seizures may only represent the tip of the iceberg, and might provide a long-overdue glimpse into both the crime and the networks that run it. If the current spate of investigations is sustained, future seizures and the continued dismantling of networks will undoubtedly allow a better understanding of the phenomenon. According to reports of the various seizures, pangolin scales and elephant ivory are the most trafficked wildlife products in the country. These products come from Côte d’Ivoire and other countries in the region, such as Burkina Faso, Guinea, Mali, Nigeria and Liberia. They are believed to be destined for Asian markets. This makes Côte d’Ivoire both a country of origin and of transit. Although poaching has long since been recorded in Côte d’Ivoire, the country has only recently been flagged for wildlife trafficking activities. A TRAFFIC report published in December 2017, which presents data on pangolin seizures and trafficking routes between 2010-2015, makes little reference to Côte d’Ivoire. In West Africa, the main states that featured were Nigeria, Guinea and Liberia. However, Côte d’Ivoire was acknowledged to be involved in a number of incidents, which highlights the need for more research regarding the scope, scale and nature of wildlife trafficking in the country. If indications are clear that wildlife trafficking exists in Côte d’Ivoire, the main challenge is preventing the country from becoming a hub for the crime. Several internal factors make the country particularly vulnerable. For a long time, Ivorian authorities have failed to prioritise conservation and anti-wildlife trafficking measures. The forest police and other bodies tasked with managing, preserving and protecting wildlife are limited by a lack of human, financial and material resources. Those involved in illegal trade and trafficking in protected species receive relatively light penalties, which shows that the issue warrants more attention. These are limited to a fine set between 3 000 and 300 000 CFA francs (between EUR4.57 and EUR457), and imprisonment from two months to a year. Corruption is generally considered an enabler of organised crime. According to EAGLE Network, some level of corruption among public officials was recorded in 85% of the arrests of alleged traffickers. Trafficking in protected species is considered lucrative, which undermines the integrity of governance systems, including security and justice. In that regard, the complicity and corruption of Ivorian public officials could contribute to trafficking. Beyond the media exposure following each seizure, which may deter some traffickers, there seems to be no indication that authorities are likely to take a tougher stance. This might be a grave oversight, given that wildlife crime is likely to grow. Wildlife trafficking is also likely to share linkages with other forms of trafficking and transnational organised crime. At the mass seizure in January this year, some of those arrested were found with evidence that could be linked to human trafficking, illicit arms, drug trafficking and money laundering. Delays in prioritising wildlife trafficking could allow criminal networks to widen their footprint and influence in Côte d’Ivoire, compounding transnational organised crime and corruption in the country and beyond. To tackle the problem, national authorities should be made sufficiently aware of the nature of the phenomenon as a form of transnational organised crime, and with it, the consequences it poses. One of the first steps should be the toughening of the existing legislation. Resolution 71/326, which was adopted by the United Nations General Assembly in September 2017, calls upon states to make ‘illicit trafficking in protected species of wild fauna and flora a serious crime’. To prevent criminal networks from deepening their presence and impact in the country, Ivorian law enforcement and justice authorities should step up investigations and increase their monitoring and surveillance efforts. To this end, awareness-raising and capacity-building activities for security forces (water and forestry agents, police, customs, etc.) should be carried out. This would serve to improve their knowledge on trafficking, techniques used by traffickers and links with other illicit activities; and to enhance investigative skills and capacity. Cooperation among the police, intelligence and judicial authorities of the countries concerned – from the sub-region and beyond – should be strengthened with a view to dismantle networks and mitigate their impact. Lastly, and perhaps most importantly, an effective fight against wildlife trafficking also requires addressing corruption in the management and protection of fauna resources.